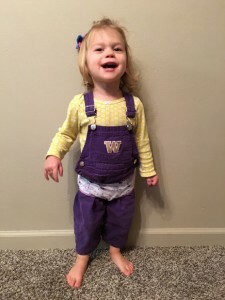 This little super hero is a Husky fan for life. Her innate intellignece is operating at optimum so she can root on the Huskies for 60, 70, 80 years and beyond! SuperBelle! The hero of this story is your Innate Intelligence. Your body has within it an Innate Intelligence that, from the moment of conception, strives to keep you functioning at your best. From the moment you were conceived, one cell grew into over eighty quadrillion cells without any direction from a doctor, drug, or research. Nerve interference or lifestyle interference can reduce your body’s innate ability to communicate or regulate itself. It is very common during the birth process for a baby’s spine to be injured, especially in the upper neck, which can reduce nerve transmission over the spinal cord and nervous system. This type of nerve interference can result in immediate symptoms like colic, constipation, diarrhea, allergies or other problems or it may lie dormant for decades until your body can no longer adapt. Lifestyle interference can also alter the expression of your body’s Innate Intelligence and resulting in nerve interference, sickness and disease. Lifestyle interference includes poor diet, being overweight, eating excessive amounts of sugar and caffeine, taking drugs, poor posture and stress. Interference is the villain of this story, your story, because it robs your body and mind of your true innate potential.